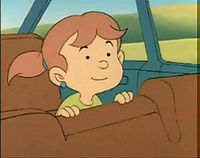 Missy, as she appears in "Mush-Rumors". Missy is a fictional real world young girl from Wichita who appears in the television show The Adventures of Super Mario Bros. 3. She only appears in the episode, "Mush-Rumors" where she and her family are supposed to be driving to Wild Waldo's One-of-a-Kind Amusement Park in the U.S. countryside, but they end up in the Mushroom Kingdom. Shortly after driving in the Mushroom Kingdom, Missy and her brother, Bud, are bewildered by this strange world, but their mother tells them to calm down and that they entered Iowa. After that, the car crashes into two walls of blocks and the car gets nearly totaled. Before Mario and Luigi arrive, Missy asks her father where they really are and Norman thinks that they might be in Nebraska, not Iowa. Mario and Luigi helps the family out afterward by pushing the station wagon into the river using the raft. Just after the Doom Ship started firing Bob-ombs out, Missy exclaims that she is glad that her parents brought her here and Bud agrees with her. After all of these events and Mario and Luigi saved them, the Doom Ship grabs the station wagon with a magnet and takes Missy's family to Castle Koopa. She then remarks that she would rather go home. After Kooky von Koopa attempts to look at the "aliens'" plans, Mario and Luigi breaks the Transmutational Brainwave Analyzer, and sends the family back to their station wagon. Missy, before Mario sends her back, asks if he was Uncle Waldo. This page was last edited on December 6, 2018, at 03:14.